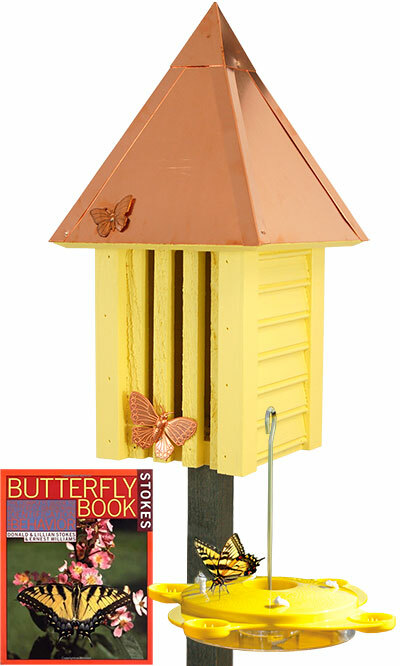 Turn your landscaping into a butterfly haven with the BestNest Flutterbye Butterfly House with Feeder and Book. This wonderful package is perfect for any butterfly lover, and will surely add elegance and style to any yard. The Heartwood Yellow Flutterbye House brings remarkable architecture to your garden, with its solid copper, hipped roof and durable cypress body. Its square shape creates a generous shelter, while three vertical slats on the front mimic crevices butterflies use in nature. The bright yellow, painted finish brings bold color to your garden, and two copper, butterfly shaped appliqués complete the piece. Place this shelter on its included, 30" long, gray wooden pole, to easily display it in your garden. For even more butterfly activity, add the included Audubon Classic Butterfly Feeder to the area as well. This timeless unit holds 12 ounces of butterfly nectar, with four fabric wicks simulating flowers. Openings in a butterfly shape adorn the yellow feeder top, offering additional dining spots, while four cups along its perimeter hold fruit. Stakes within each cup keep the banana or apple piece secure, for the insects to easily dine, and an integrated ant cup in the center prevents pests from sullying the nectar. Use the included hanger to place this feeder on a bracket or hook. Once you have placed your feeder and house, read the included Stokes Butterfly Book to learn all about the behaviors and life cycles of these fascinating creatures. Gain further appreciation for beautiful butterflies with this Flutterbye Butterfly House with Feeder and Book package. House made in the USA. Book Details: 95 pages, paperback, 8.5" x 11"